Five units of the Dublin Fire Brigade are at the scene to try and contain the blaze. A FIRE HAS broken out on the roof of Oberstown Detention Centre. A spokesperson for Dublin Fire Brigade said that they received the call about a blaze breaking out on the roof at 7.50pm. There are currently five fire engines at the scene and another on its way. There is also a foam cannon and 30-foot ladder at the scene as well as two district officers. At this point, firefighters do not know what caused the blaze. Earlier in the day residents climbed onto the roof of the centre while staff were striking in a row over safety. A spokesperson for Oberstown said it is understood that it was some of the residents who caused the fire. There are no reports at this time of any injuries. It’s understood the residents were supposed to stay in their rooms until 4pm today, when the 8-hour work stoppage came to an end. Some 150 staff were involved in the strike over the increased number of assaults. Siptu and Impact say the new campus is badly designed to deal with young offenders. However, some of the residential care workers came off the picket line to deal with incidents at the centre. Earlier reports said that five residents had climbed onto the roof of the campus. Garda Helicopter over Oberstown Detention Centre,five detainees have climbed onto the roof as Staff picket over Health and safety issues. Management at the country’s only youth detention campus said today’s industrial action posed a serious health and safety risk, with emergency cover in place. Oberstown director Pat Bergin told on RTÉ’s News at One, “We’re looking to sit back down and address what the core issues are. It is quite distressing for everybody. It is a situation that will have to be concluded, a resolution will be reached. The Minister for Children and Youth Affairs, Katherine Zappone says she’s disappointed that “vulnerable young people will be impacted by the action”. Fianna Fáil Spokesperson on Children & Youth Affairs Anne Rabbitte said, “There have been a number of violent incidents in recent months where staff and residents have been left traumatised. Despite this, there has been very little improvement in security training or staff resources. 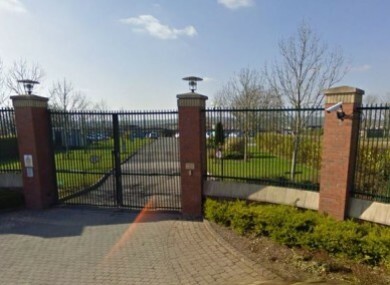 There have been a series of issues at the Oberstown site following the transfer of older teenagers from St. Patrick’s and Wheatfield last year. “Staff at the facility have become so frustrated with the situation that they have had to undertake industrial action. With additional reporting from Gráinne Ní Aodha and Aoife Barry. Email “A fire is blazing on the roof of Oberstown's youth detention centre”. Feedback on “A fire is blazing on the roof of Oberstown's youth detention centre”.